First of all, it is important to mention that APEMAN offers few different models – this is a apeman a80 review, the version which has 4K. I don’t recommend buying the cheaper apeman models with only 1080P, because the difference in the quality is noticeable – while the price difference is not very big. The video quality of apeman a80 is excellent – sharp and clear. At 4K you get 25fps (frames per second rate). I do want to mention that there are some other action cameras in this price range with a little bit better video quality. One of them is YI Lite (Amazon link).It is made by Xiaomi and the video quality it offers is really excellent. Without any doubt – one of the best models in the market. If you want to compare the APEMAN a80 model (with 4K) to the cheaper models – click here (Amazon link). 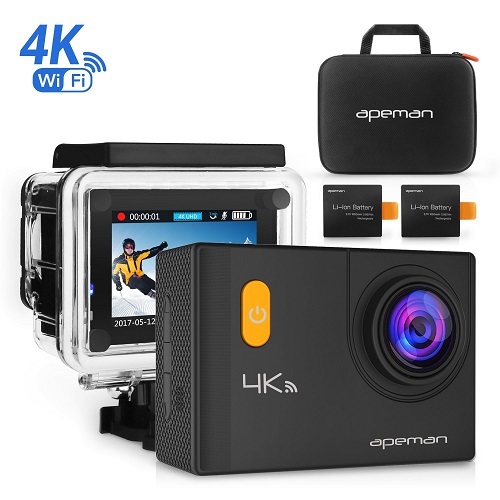 As I mentioned – because the price difference is not huge, I highly recommend buying the 4K version, the one that I am talking about in this apeman action camera review. I think it’s great that Apeman offers different models, but since 4K is the standard pretty much these days, I see no reason to buy any other model. Below you can see a video test shot with APEMAN A8 4K. As you can see – the video quality is just excellent ! Like many other action cameras, the APEMAN sports camera has built-in WIFI. You can easily connect it to your smartphone or tablet. All you need to do is download the Final Cam (Android and iPhone) to your smartphone or tablet. The app itself is very easy to use and the pairing process does not take more than a minute. The control range of the apeman action camera is great, and everything works smoothly. Few years ago, you would have to pay a lot of money for a camera with WIFI. Nowadays, these WIFI modules are cheap and camera companies can easily use them in all of their models. Some action cameras also come with a remote control – but in my opinion, as long as you have the WIFI function – it is not a must have thing since you can do everything from your smartphone. The built-in 2″ display is great. You probably would not use it too much if you pair the camera to your smartphone. There are sports cameras out there with bigger screens, but in my opinion – 2″ is enough. Most of the times, the bigger the screen is – the bigger the action camera itself will be. I prefer compact cameras, even if that means a little bit smaller screen. 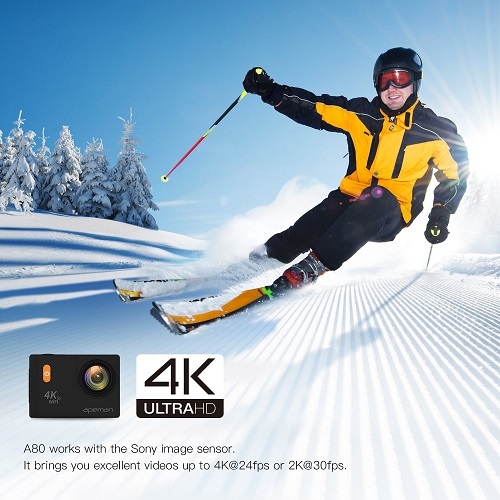 There are also action cameras online with 2 screens – but they cost more. Remember – the bigger the screen is – the less time the battery will last. The APEMAN action camera uses a 1050mAh battery which provides great recording time. Currently it comes with 2 batteries – but that may change in the future in my opinion. Since charging time is fairly long, it is great to have a spare battery you can use at any time without waiting for the first battery to be fully charged. 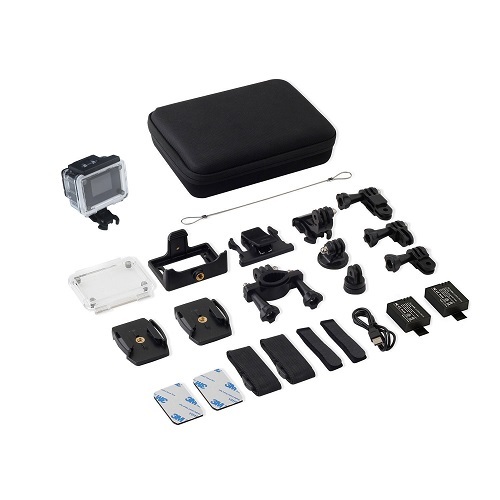 The APEMAN action camera comes with different mounts and accessories. Using them you can attach the camera to anything, for example – a helmet. You also get a waterproof case. After installing it you will be able to record video when in water. This is very useful of course. Many action cameras come without any waterproof case, and it is pretty expensive to buy it – so you save money here. The APEMAN action camera is great and I defiantly recommend buying it. It is pretty popular now, and it’s obvious why – it offers great video quality and the price is pretty affordable. Sure you can find even better sports cameras online – but they will cost more money. Not all people need “the best” action camera. And for those – APEMAN is more than enough. I hope you found this apeman action camera review useful. If you have any questions about this device or other action cameras – feel free to comment below. Make sure to check out other interesting and useful action camera reviews on our website. We do our best to review the latest and most popular devices in the market. Share this apeman a80 review with your friends ! I have just bought the Apeman A80. It is a great size, came with loads of accessories however i am not impressed with the battery life. I have purchased 2 further batteries in preparation of on upcoming trip. Testing them around the house non of them last for as long as claimed in the Apeman literature. Is anything being done to rectify this. How is the sound quality? Would this be a good camera to video a wedding?